Grand Opening of Partha Dental clinic proudly announces the opening of its 79th Specialty Clinic at Sun City Bundlaguda, Hyderabad. Painless Extraction & Implant Treatment in Partha Dental ! Treatment of Tooth Cleaning and Polishing in Partha Dental ! Get an Implant Now Pay Later in 8 EMIs. No Intrest. No Processing Fee. Teeth Crowns Treatment in Partha Dental ! Root Canal Treatment in Partha Dental ! Loose Teeth Treated with Implants Treatment in Partha Dental ! Implant for Comfortable Chewing at Partha Dental ! Treatment for Sensitive Teeth in Partha Dental ! Implant Treatment in Partha Dental ! Suitable treatment for gaps & discolored teeth in Partha Dental ! 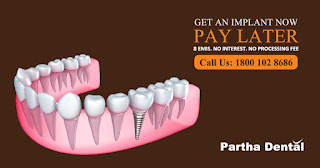 Easy & Latest Technique of Implant in Partha Dental !